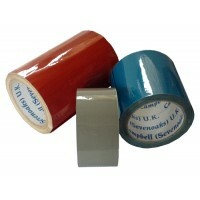 All Weather Pipe ID Tape- Campbell International Specialist Tapes. 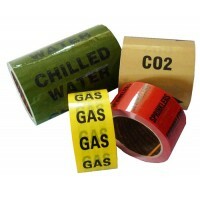 Campbell all weather external pipeline identification tapes are produced from high specification polyester substrate and laminate to give long-term resistance to all chemical conditions and hostile environments. They demonstrate excellent ultra-violet resistance which preserves the colour fastness of the inks which themselves have a very high UV tolerance. 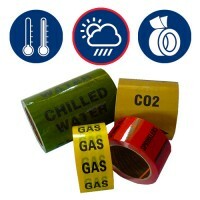 Our all-weather pipeline identification tapes also have an extremely low chloride content which makes them suitable for use on all pipe surfaces including that of stainless steel. Leachable chloride less than 10 parts per million. Stock widths are usually 50mm, 100mm or 150mm with a length of 23m. Need even more protection? 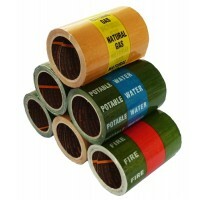 Our Clear PE Protective Tape can be used over the top of any of our Pipe ID Tapes to provide unbeatable lasting protection. Size: 300mm x 50m	Colour: Orange/White	Technical Specification: White Polyester laminated with Linerless Transparent Polyester Excellent UV Protection. Resists most common oils, aliphatic solvents such as Heptan, Kerosene and alcohols when applied to impervious substrates. Suitable for use on all p.. Size:150mm x 23m	Colour: Green 12 D45 / White / Red / White / Green 12D45 Bands as per British Standard. Technical Specification: White Polyester laminated with Linerless Transparent Polyester Excellent UV Protection. 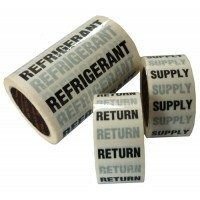 Resists most common oils, aliphatic solvents such as Heptan, Kerosene and alcohols..